I use the Divi WordPress theme designed by Elegant Themes on a lot of sites I design for clients. It is a a page builder theme – I usually explain it to clients as saying it is a bit like LEGO, you add blocks on top of each other to create the function and layout of a page that you need. But it does mean the page end of pages (and potentially) posts have a different look from the normal WordPress editor. There are now 2 ways to edit posts / pages. 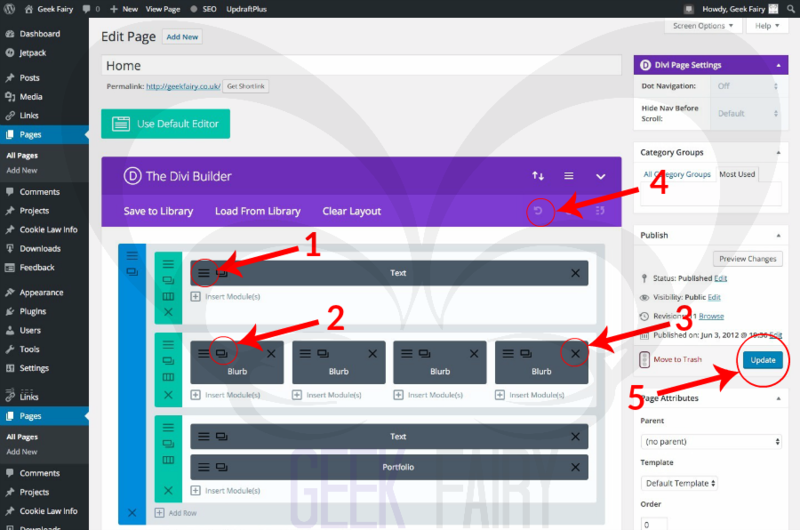 Using the Divi Builder or using the Visual Builder. Both work in a similar way, and it is often personal preference which you use. The visual builder has the bonus of being able to see live the changes you made. 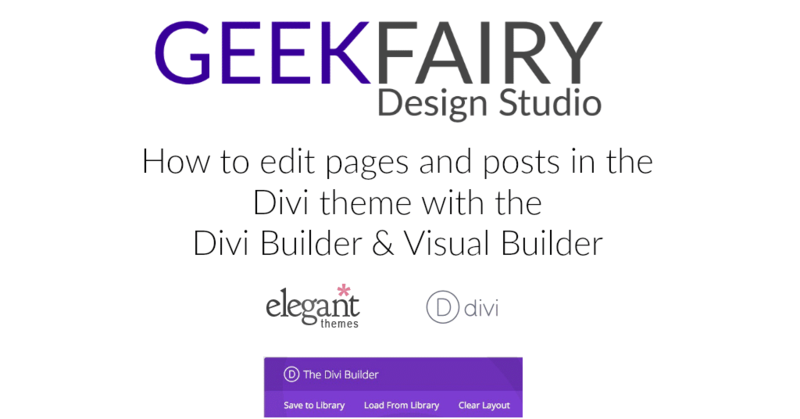 Here is a simple guide to editing pages that are built with the Divi Builder. Input the Username and Password you have been given. You will then be logged into the dashboard. Using the image above and the arrows and numbers – you can do the following. For more details of how to edit a module see the next image. Click on the 3 horizontal lines to open and edit a section. The modules will correspond to how the page looks. E.g. Text /Image/Slider/Gallery. The 2 overlapping boxes – this duplicates the module type and contents. Once you click to edit a text section you will open a familiar WordPress editing box. Edit as you would any other WordPress page, using the tool bar at the top for Add Media, text size and look etc. On the main page Builder page (See top image) click on Insert Modules and you will get the option screen above. Then once in place, click on the 3 horizontal lines to edit that module. Once it has loaded when you move your mouse cursor around it will show the settings bar for each section, row and module. Either use the settings button in a text module and it will open up the familiar text box, or if you click into the text without clicking the settings icon you can edit it there. Once you have made any changes you need to save them to go live. To view the site in different screen sizes use the icons on the left, to undo anything use the clock icon in the middle. There are many other features in the visual builder that you can discover, just make sure you have a back up before you start trying them all out.